CANBERRA, Australia – Members of Parliament and visitors gave Australian Prime Minister Kevin Rudd a standing ovation after he made a long-awaited apology to Australia’s Aboriginal peoples. Rudd spoke of the “profound grief, suffering and loss” experienced by an estimated 50,000 indigenous people over 70 years of government assimilation policies predicated on separating Aboriginal and Torres Strait Islander children from their families and homes. 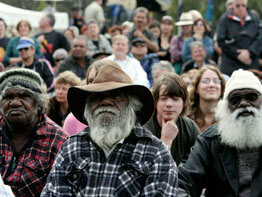 The indigenous peoples of those decades are now referred to as the Stolen Generations. Separated from their families, the children were raised at church-run missions and sent into the work force as farm laborers and domestic help. Many did not know their original identity or where they came from. Their stories of generational dislocation and loss were collected in “Bringing Them Home,” a government-mandated human rights report published in 1997. “We apologize for the indignity, the degradation and the humiliation these laws embodied,” he said. “For true healing to take place we must acknowledge that this national apology is not a point of arrival, but a point of hope and a point of departure,” he said. Archbishop Barry Hickey of Perth, chairman of the bishops’ Commission for Relations With Indigenous and Torres Strait Islander People, told Sydney’s The Catholic Weekly newspaper that the apology would “free up the emotional logjam” and help Aboriginal people, as individuals and groups, to approach their future with greater optimism and determination. “The general population has been far ahead of its political leaders on this matter, just as the people were on the 1967 referendum which granted full citizenship to Aboriginal people,” Archbishop Hickey added. Before his speech, Rudd said he had consulted with an Aboriginal woman, now in her 80s, who at age 4 had been forcibly taken from her mother by “the welfare men” at Tennant Creek in the Northern Territory. “She remembered her mother clinging to the side of the truck, with tears flowing down her cheeks as it drove off. She never saw her mother again,” Rudd said. Later, in Alice Springs, a change in government policy handed over the children’s welfare to church-run missions, Rudd said. “The kids were lined up in three lines. Those on the left were told they had become Catholics, those in the middle, Methodist, and those on the right, Church of England,” Rudd said. He also promised that indigenous children living in isolated communities would be given preschool education in math and reading. He further pledged his government to close the “health gap” between indigenous people and the rest of the Australian population within the decade.